This quote from Scot McKnight was posted some time ago in his comments thread as part of a response to someone who was responding to a blog post he wrote entitled, "Kingdom of God, Politics, and Romans 13." It is very common, and in fact is an accepted and unexamined truism among many Christians that there exists a church that is not institutional. When I am engaged in such discussions I like to ask folks to describe a non-institutional church. I usually get responses like, "A non-institutional church isn't overly organized or have much bureaucracy," or a non-institutional church "doesn't have man-made rules, but only relies upon the Bible," or a non-institutional church would look like the church of the New Testament." 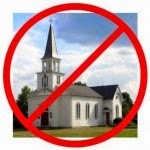 Of course no church, even an autonomous congregation fails to have organization or bureaucracy. Any organization to be effective needs to be organized. And every church, even ones who claim only to be biblical, do all sorts of things that are not directly mentioned in Scripture and teach certain interpretations of the Bible that are bad interpretations. And finally, the New Testament church was far from perfect, and only a rose-colored reading of the New Testament would say otherwise. In human history there has never been a pristine time when the church has lived up to the ideal, nor is there one New Testament church. When people mention getting back to the New Testament church, I always ask which one they want to get back to-- the church in Corinth where a man is sleeping with his step mother and the church is giving its approval, or the churches in Galatia where some of its members, at least, have reverted back to Torah observance; or perhaps they want to go back to the Philippian church that appears to be deeply divided? Which New Testament (and thereby non-institutional) church do we want to emulate? ...a church that we approve of as consumers of the gospel. The search for the non-institutional church is a search that selfishly becomes all about us.